Waterberry Hill - Hazyview Accommodation. Here, guests can enjoy beautiful nature walks or simply relax bushveld-style. Hazyview is only a 6km drive from the resort and is an interesting outing to explore unique shops, crafts, restaurants and pubs for some fine fare. Big game and big attractions are to be found nearby. Enjoy tennis, mini golf, and table tennis, or cool off in the large swimming pool or take a drive to nearby attractions including the Kruger National Park, Gods Window, Bourkes Luck Potholes and the Blyde River Canyon with its spectacular waterfalls. The chalet is cleaned once a day except Sundays, and linen is changed twice a week. There is an open, secure parking lot. These 166m2 self-catering chalets face the bush and have garden views. The chalets have a terrace with a private charcoal braai area and are located close to the Boma. These chalets also have a Jacuzzi. Chalets 1-7 and 14-19 are situated close to the resort main pool. The main bedroom sleeps 2 in a double king-size bed. The second bedroom has two single beds. These chalets have 2 bathrooms. The en-suite bathroom has a spa bath, shower, toilet and basin. The second bathroom has a shower toilet and basin. These chalets are on ground level with stairs up to the chalet as well as a few internal stairs. These chalets are suitable for someone using a walking aid, but not suitable for a wheelchair. Pets are not allowed, but a guide dog is allowed in the chalet. The A and B chalets interlead. This 166m2 self-catering chalets face the bush and have garden views. The chalet has a terrace with a private charcoal braai area and is located close to the Boma. This chalet also has a Jacuzzi as well as private swimming pool. This chalet has 2 bathrooms. The en-suite bathroom has a spa bath, shower, toilet and basin. The second bathroom has a shower toilet and basin. This chalet is on ground level with stairs up to the chalet as well as a few internal stairs. It is suitable for someone using a walking aid, but not suitable for a wheelchair. Pets are not allowed, but a guide dog is allowed in the chalet. The A and B chalets interlead. These 89m2 self-catering chalets face the bush and have garden views. The chalets have a terrace with a private charcoal braai area and are located close to the Boma. Chalets 1-7 and 14-19 are situated close to the resort main pool. The main bedroom sleeps 2 in a double queen-size bed. The second bedroom has two single beds. These chalets have 2 bathrooms. The ensuite bathroom has a shower, toilet and basin. The second bathroom has a bath toilet and basin. This 89m2 self-catering chalet faces the bush and has garden views. The chalet has a terrace with a private charcoal braai area and is located close to the Boma. This chalet boasts a private swimming pool. This chalet has 2 bathrooms. The ensuite bathroom has a shower, toilet and basin. The second bathroom has a bath toilet and basin. At Waterberry Hill, Lovely bushveld walking trails around the resort bring you very close to a variety of birds and small animals, don't forget your camera! Get the whole family to join you for a game on our whacky adventure golf course, custom designed for Waterberry Hill. Great for outdoor fun! 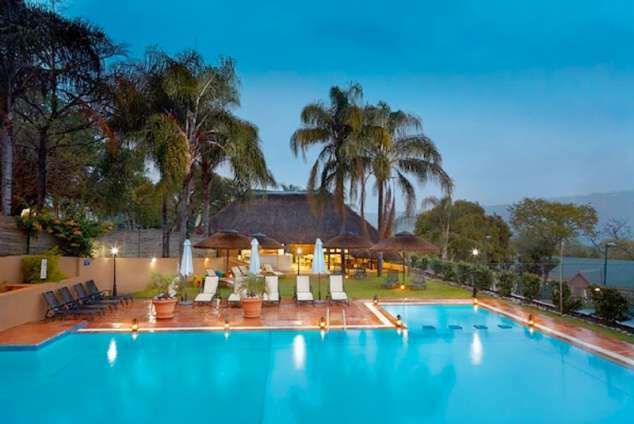 Beat the Mpumalanga heat with a dip in our large swimming pool with panoramic views of the surrounding hills, or enjoy a good read on the comfortable loungers alongside. Table tennis, darts, tennis and a kiddies playground are available onsite and the daily entertainment programme ensures fun and games for every member of the family. Mpumalanga has over 550 bird species, and a variety of habitats. You are sure to tick a number of interesting species off your checklist while visiting Waterberry Hill. Bird List. The onsite wellness spa will pamper you with an extensive range of sublime treatments and massages. For added relaxation, try an outdoor treatment. Men and children are also catered for. The resort has an emergency supply kit. Waterberry Hill is suitable for someone using a walking aid, but not suitable for a wheelchair. Mpumalanga summers are hot and as a result, you should pack items that are light and cool, and make sure you wear your sunblock. Please consult with your GP regarding malaria prophylactics well in advance as certain times of the year can pose a slight risk of contracting this disease. Winters are mild, and the best time for game watching – essential items for this activity are a pair of binoculars and a camera. Bring your costume for cooling down at the onsite pool back at the resort. Travel time from O.R Tambo International Airport to Waterberry Hill is about 5 hours. 1 From Nelspruit N4 at the 4- way traffic light intersection, turn left on R40 towards White River pass Crossings centre for +- 20km. 2 From White River travel on Paul Kruger road to the 5th traffic light. Turn left onto R40 Theo Kleynhams Street towards Hazyview, at the circle by Casterbridge Centre take the second exit R40, then travel for +- 45km on the R40 towards Hazyview/Phalaborwa. 3 Please avoid Hazyview Turn Off R538. This is not a recommended road. 4 Pass 1st Kiepersol Turn Off. 5 Pass Nabana Park on your right, pass the Viva garage on your right +- 800m turn left at the 2nd Kiepersol road sign posted Waterberry Hill. 6 Continue to a t-junction, turn right into Perry’s farm dirt road and approximately 3.5km down the road you will be at Waterberry Hill on the left hand side of the road. 1171 page views since 28 Jun, 2018.